The quant Anantara Hoi An sits on the bed of the Thu Bồn River river. It’s colonial style look, soft pink color and lanterns spread across the property fit right into the colorful ancient town of Hoi An. It truly was a magical place to spend a few days, especially considering that it’s located in walking distance from all of the attractions that bring people to Hoi An. I felt as though my experience at Anantara Hoi An was not just that of a regular hotel as it had a sort of charm to it that I couldn’t necessarily put my finger on. Like I said, everything is in walking distance from the property, which makes exploring the old town of Hoi An very easy. However, you are still afforded a quiet and peaceful space away from the bustling streets. I loved waking up in the morning to the peaceful passing of tug boats and vegetable boats out my window and no sound of the craziness of the streets. We enjoyed a BBQ dinner on our third night, as well as breakfast every morning. 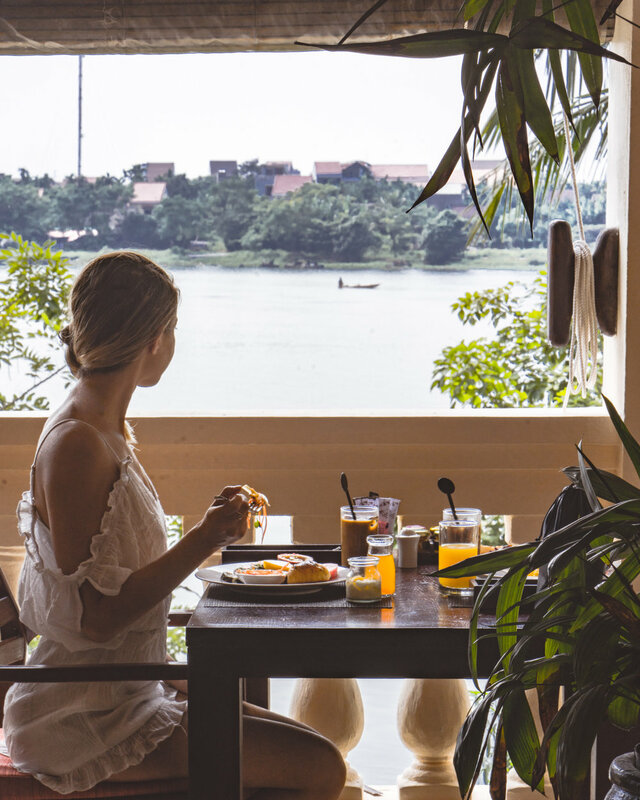 It’s lovely to be able to wake up in the morning and meander up to the dining area overlooking the water for a breakfast buffet every morning. There were so many options to choose from from smoothies to juices to eggs, bacon and toast to the more traditional fair of Pho. Eating dinner at Anantara Hoi An was equally as lovely, as we enjoyed an assortment of meats, as well as pasta that was made to order on the spot. Of course, we also enjoyed a bottle of wine with our meal. The whole experience was amazing. The property was so beautiful itself. There were an endless amount of photo opportunities and I just loved that it was pink! They also took a lot of care in the design of the hotel to assure the comfort of the guests. For example, there was a beautiful reading area that had a bookshelfs of books and lounge chairs out on a large pavilion for those who wanted to take a break after spending a few hours exploring Hoi An. I also loved that they afforded their guests bikes to take out on the town if they wish to do so. The service was excellent and we were greeted with a smile every time we entered into the hotel. I also loved how a lot of personnel would stop to chat and ask us how our day was going and if we needed any tips. Anantara Hoi An is a lovely hotel that I can highly recommend. It lends a magical feel to your stay and makes for a lovely trip.